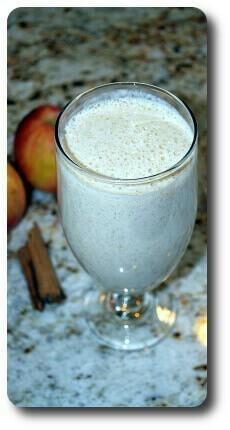 This smoothie blends roasted apple and cinnamon flavors into a festive year-round treat! Wash and halve/quarter apple. Remove core. Microwave for 45 seconds at 70% power. Let cool. Add ice cubes and yogurt to blender. Crumble cinnamon stick with your hands into the mixture. Add apple. Blend until smooth. Start on low setting until apple and ice have been reduced to small chunks, then increase to 50% speed for 15-30 seconds. Then enjoy! We've experimented with 1/4 cup milk instead of yogurt. The result is thinner than the yogurt version, but the taste of the apple and cinnamon is bigger. Almond milk may be a delicious substitute. Opinions were divided on the texture of the smoothie; some of us prefer the thickness of the yogurt version. We may experiment with a tablespoon of sugar-free instant vanilla pudding. In our tests, we preferred Fuji apples. A nice ripe Red Delicious would do in a pinch. Golden Delicious or Granny Smith probably wouldn't work to our taste—it's better to use a sweeter apple or a baking apple.